From left, Larry Bach (WC Overfelt); Gil Agoylo (Silver Creek); Victoriano Castillo, Jr. (Independence); Maria-Lai Tran (Independence); Tom Reisz (SJSU); and Mary Barrett-Wong (Silver Creek) discuss high school math curriculum during a workshop in Chino, Calif.
San Jose State University is seeking to increase the odds that incoming students are proficient at math before they even set foot on campus. SJSU has entered into a cooperative program with the East Side Union High School District to kick off a new math instructional curriculum known as Mathematics Reasoning with Connections (MRWC) in fall 2017 at five of the district’s campuses: Independence, Overfelt, Mt. Pleasant, Silver Creek and Santa Teresa high schools. The curriculum is designed to help students grasp the concept behind mathematical formulas as well as meet minimum standards for proficiency set by the California State University system. 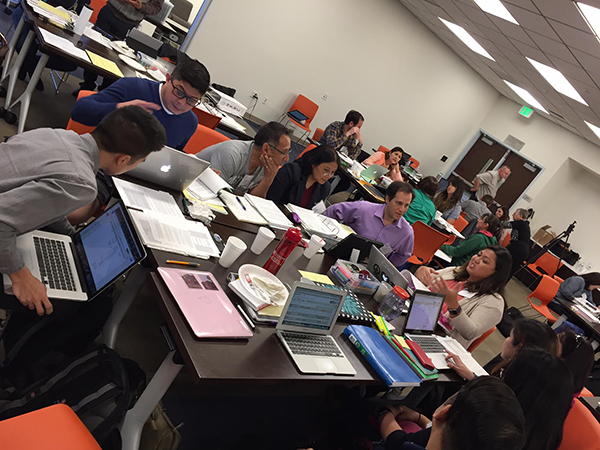 SJSU is part of a consortium of several other CSU campuses, including Cal Poly Pomona and Cal State San Bernardino, along with high school districts, that has secured a state grant of nearly $1.3 million, the California Math Readiness Challenge Initiative Grant. The funding is being used to devise the new curriculum, cover operations beginning in the 2017-18 academic year and provide professional development number of math teachers districtwide, according to Tom Reisz, program coordinator for SJSU’s Early Assessment Program and Early Start Program. Four other experimental math instruction programs — in consortiums led by Cal State Monterey Bay, Cal State Sacramento, San Diego State University and UCLA — have also received state grants of the same size, according to Reisz. Preparing incoming students for study at the college level to increase their chances of earning a degree in four years is one of the university’s Four Pillars of Student Success Plan. Students who enter SJSU with remedial needs are less likely to graduate in four years, with only six percent of students with double remedial needs graduating in four years compared to the the overall four-year graduation rate of 14 percent for 2016. In fall 2015, 16 percent of students in Santa Clara County high schools fell short of the CSU math requirements, according to data from the California State University system. Among the freshman class admitted to SJSU in fall 2016, about 22 percent of students failed to meet the minimum math standards. High schools students have several ways to show they are prepared for college-level math, through exemptions described online or by passing the entry-level math (ELM) exam. Those without an exemption or an acceptable score on the ELM are required to enroll in remedial math classes to prepare for general education (GE) math. CSU officials want to decrease the number of students needing those remedial courses through the Early Start Program, which seeks to improve the level of academic readiness among students entering the university with remedial requirements in math, English or both. Last summer, Reisz said 914 incoming students took remedial math classes both on campus and online. “Students often leave high school with a better understanding of mathematical procedure than conceptual underpinnings of math topics,” Reisz said. A math concept is defined as the “why” or the big idea of math — knowing the workings behind the answer. Math educators contend gaining knowledge of concepts reduces the need for having to memorize answers or formulas. Reisz said instructing students in math concepts is emphasized in the Common Core State Standards that have been adopted by the California Department of Education, as they have in 41 other states nationwide. High school students who reach such advanced math disciplines as Calculus are familiar with an emphasis on learning concepts. The new curriculum to be introduced this fall in the East Side district will emphasize this approach from Math 1 classes to Calculus, according to Lyla Hua, an instructional coach for the district. She will directly advise nine math teachers at the five participating schools in the new curriculum starting later this year, but preparation has already begun. 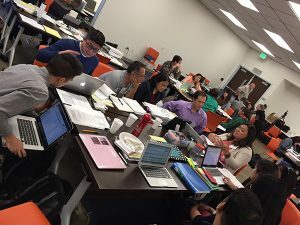 “The program may not begin until the fall, but we are all actively engaged in early conversations about the program,” said Hua, who attended a workshop about the California Math Readiness Challenge held in early March in the Los Angeles suburb of Chino with the teachers selected for the program. Hua said the major benefits of the new approach to teaching math will be teachers and students using communication, collaboration, flexibility and creativity in solving problems.